In the heart of downtown Minneapolis and parallel to the Mississippi River are miles upon miles of running trails. 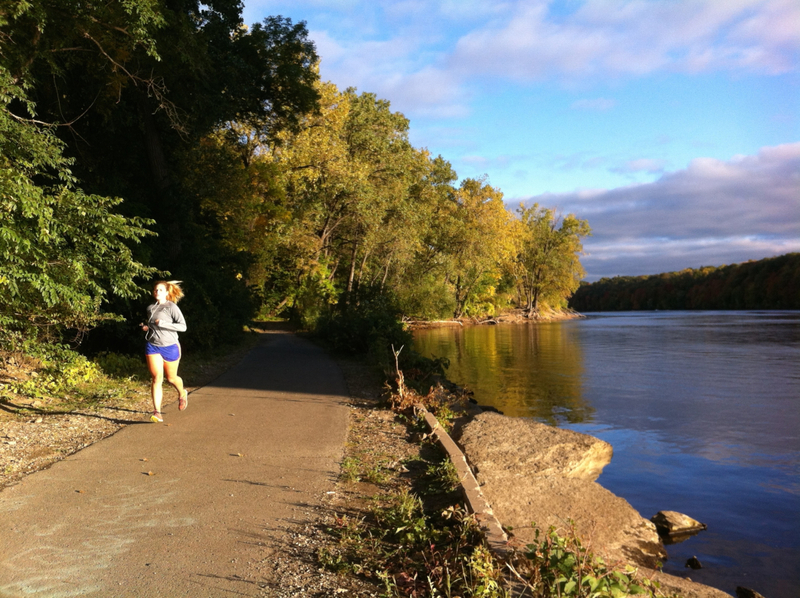 Running alongside the river is one of the best road running options in the Twin Cities. After a long day of work or on a quiet Saturday morning, many Twin Citizens lace up their running shoes and hit the trail. Just like entering a candy shop, Minneapolis offers a wide selection of designated pedestrian trails (more than 55 miles), of which are found all over the city. The most scenic, and often least crowded option is the Mississippi River Road Trail. Following the river for 8 miles on both sides and zigzagging along historic bridges, this trail offers runners the opportunity to “make your own” run. 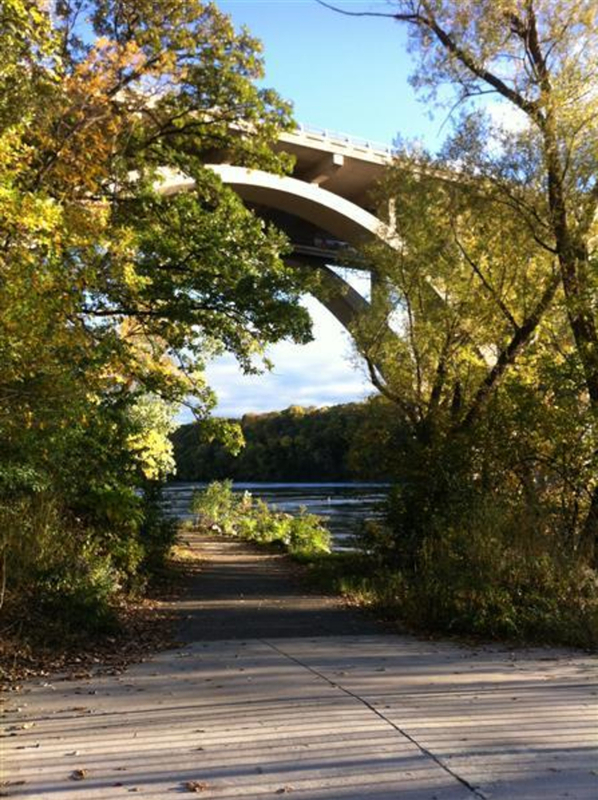 In total, there is a 16-mile loop that takes you from the Broadway Bridge to Minnehaha Falls and back. You will forever remember that moment when you reach the basin of the Minnehaha Falls, take a seat on the pedestrian bridge, and feel the waterfall's mist cool your rosy cheeks. Minneapolis is home to avid long-distance runners and for the last 30 years, the Twin Cities Marathon has been an iconic fall event. Often dubbed as “the most beautiful urban marathon in America,” runners from all over the country come to Minneapolis to compete against some of America’s best runners. Running Times magazine recognized the Twin Cities Marathon as the third most competitive marathon in America in 2006. It is no secret that the hype is all thanks to the 4-mile portion of the race bordering the scenic Mississippi River. All along the East and West River Parkway, there is parking available. 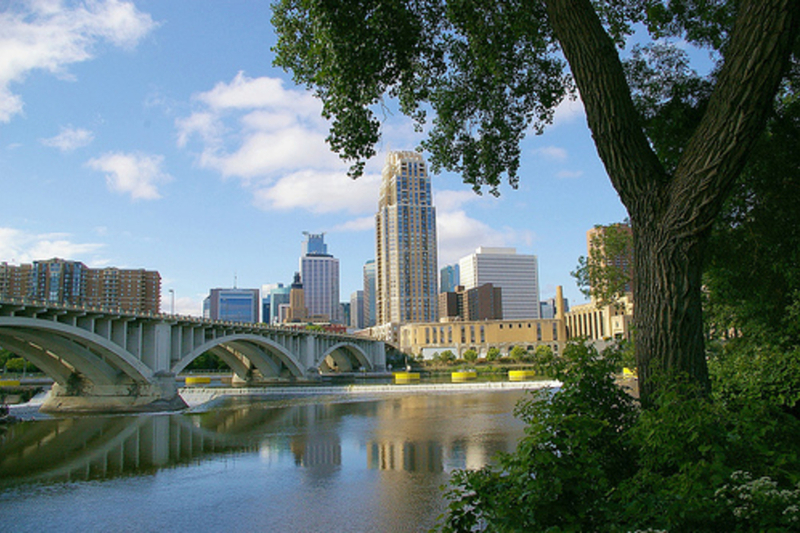 The Mississippi River Trails are also easily accessible by Minneapolis’ myriad of bike lanes. Bike racks are available throughout the whole 16-mile loop. There are no enforced hours, unless you want to explore the dirt trails, which are found in the river valley. They parallel the paved trails. Some portions of the trail are not well lit, so plan accordingly before running at night. Though the trails starts at Washington Avenue Bridge, the most popular starting place is at the historic Stone Arch Bridge. On the west side of the river, start your run with a short incline, passing by the world-renowned Guthrie Theater. The trail continues to rise and fall in elevation until you pass under the Franklin Avenue Bridge. From here, you have a choice. Either, you can continue south on the west side of the river and enjoy the scenic views of the Mississippi River valley or you can cross over the river and take a staircase down to the river valley. Offering quiet trails meandering along the mighty Mississippi’s riverbank; this trail is a runner’s paradise. This trail ends with a lung-bursting switchback a mile before the Lake Street Bridge. Lake Street offers a great turnaround point for those runners who don’t want to run so far. If you want to finish at the roaring Minnehaha Falls, then continue south along West River Parkway trail. The trail weaves right and left, following the bluffy Mississippi ridgeline. There are even a couple trail exits that offer dirt trails for those runners who prefer running on softer ground. This portion of the trail boasts some of the best view of the Mississippi River Valley. Especially during the fall months, the trail is aglow with yellow, red, and orange foliage.